A St. Louis, Missouri resident will be indulging in some much-needed downtime tonight after a long day of working at a busy cafe. 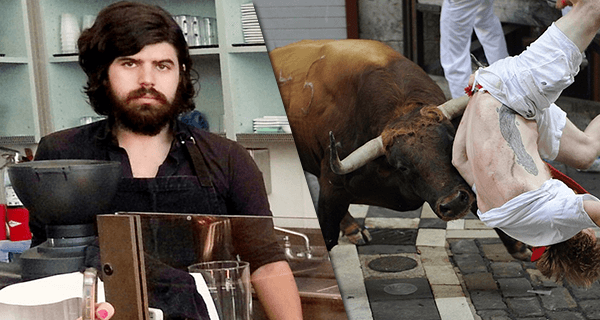 In an effort to treat himself after serving the general public for eight consecutive hours, the barista plans to unwind with a nice, 12-minute video featuring bulls mauling spectators at various festivals in Spain. Dennis Belich, 31, usually works just over 40 hours per week at his customer service position. “I take food and drink orders, ring people up, pour granola on the parfaits, that sort of thing,” he explains. Following a particularly rough day, Belich looks forward to feeling the tension in his muscles slip away at the sight of spectators being gored by the horns of a large, disgruntled animal. “After a long day of repeatedly answering the same questions, all clearly stated on a menu not two feet above my own head, nothing feels better than kicking off my shoes, sinking into the couch, and forgetting all my troubles as I witness dozens of people getting flipped like rag dolls in the street,” Belich explains. The violent footage will give the young man a much-needed reprieve in an otherwise stressful week. “I mean, that’s what it seems like the bull is thinking,” he adds. The video, just one of many Belich has downloaded for easy reference on his computer, is part of an ongoing, self-care routine Belich has worked to create for himself, with the help and medical guidance of a trained and licensed therapist. Belich hopes to enjoy soaking in the relaxing comfort of knowing that somewhere, some guy will have trouble putting too much weight on his right knee for the rest of his life. “It’s the little things,” Belich says.